Let's start with Joan Didion, the writer that first encouraged me to explore the realms of creative nonfiction. She says, "I write entirely to find out what I'm thinking, what I'm looking at, what I see and what it means. What I want and what I fear." Now that the initial research is over (the cold calls and the stuttering, the street interrogations of strangers), I have finally locked down two stories. I should be kicking up my feet and taking deep breaths, if not just for a moment, right? For me, the real fear just begins. We all have our questions that we map out before we talk to our subjects, maybe on a piece of paper, maybe in our heads, and we think of our conduct and our body language, etc, to put the person we're talking to at ease. But what we can't possibly anticipate are their reactions to these questions, their language, their facial expressions. As documentarians, we can only plan for so much. We have to learn to think on our feet, and find some comfortable medium between clipboard journalist and unlicensed therapist. I am working with two women, both in the process of overcoming extreme adversity. Their answers to my questions are difficult, the types of answers people often turn their ears from. Their stories are hard, almost too hard to imagine. One of the women even asked me, "Why are you interested in such a subject?". I suppose I'm interested because I fear it so much... we as a society fear it so much. We fear the realities of grief, of overcoming adversity. Perhaps these brave women can provide us with some light rarely shed on these issues. And with that, I also need to be mindful of my own psyche, and acknowledge that my conversations with these women are difficult, and that I can grant myself space to process what I've heard. With some awareness of self throughout my time at Salt, I can be true to my subject and true to what I produce. "finding something meaningful in a hard or new situation". Or asking questions like: If this were happening for a high purpose, what would it be? I questioned this higher purpose/learning thing when on Sunday I, instead of indulging in the New York Times and strong espresso, was sitting in a house miles from Portland, working on a story about a variety of different motorcycle ministries. I thought to myself, Dear God, how did I get here and why is my head pounding? Outside it was raining cats and dogs and inside, I was claustrophobic, stuck behind two couches, the lighting was terrible, every picture was blurry and the snap of my shutter echoed across the room during every prayer. I felt out of place and recognizing the need for fresh air, was relieved when the time had finally come to exit the building. I asked myself, was I the only person who thought that was strange? The following day I was relieved to find myself suddenly whisked away to a place that felt a little closer to home. On the collective farm that day, I ate an apple right off the tree and felt the breeze off a beautiful lake. I heard a woman talk of justice and equality and pesticides and living in a community of like-minded people. I weaved in and out of drying laundry and dill plants. I felt the mud seep up over my sandals. I climbed a ladder and sat under the skeleton of a house in progress. I watched two little kids make ice-cream out of dirt and imagined the dirt melting back into the ground. The birds chirped and the leaves rustled. I asked myself, how wide must our eyes be in order to see and feel beauty? As I wonder about the concept of storytelling, I wonder how I am going to document these very different stories. I wonder how my different levels of curiosity and intrigue will affect me. Beyond my camera, my experiences of two very different slices of life happening within two hours of each other was enough to prove that some moments are truly strange and others are simply beautiful. I started grinding my teeth last night. I've never done that before. Several friends of mine have - some even have had to get head gear from their orthodontists to prevent them from getting lock jaw. I guess I've never been that stressed before. Short bursts of stress, yes, but a continuous dull ache of stress that persists throughout the day and into my dreams...that is new. I dreamt of one of my subjects from my mini-ethnography the other night. I awoke with an image in my mind; a photo I wanted to take. I don't want it to seem like I'm writhing in confused misery. It's actually quite exhilarating - this feeling of uncertainty I'm growing used to - of constantly being on the brink of some big discovery. It's "story lock-down" day on Friday, and I still feel like I'm on story-try-it-out or story-vague-idea-that-will-hopefully-develop-into-amazing-story day. I'm on the hunt. This feeling, I hope, will bring me closer to my subjects. I'm happen to be pursing a story about people who go hunting for sport - not hunting for animals, but for small boxes of treasure called "caches" that they hide in various places all over the state, using plotted coordinates on a GPS device. It actually exists all over the world, this secret world of "geocaching," and boy, are people passionate about it. I've spent hours over the past two weeks talking with cachers and poring over their online forums, immersing myself in such joys as the "FTF" (First Time Find) - being the first one to find a particular treasure, like an old explorer being the first person to tread on uncharted land. I wonder, what is it about geocaching that enlivens the passions of grown men and women from seemingly all walks of life? I spoke with a cacher named Dave, from Bangor, about why he thinks people cache. He said that he thinks it's part of human nature to hunt, "whether for food, tools of buried treasure. Humans were the first to explore the Earth and have continued underground, underwater, and into space...geocaching makes it possible for average Joes to participate in these activities while remaining in a safer environment than Lewis and Clark or pirates from the middle ages..." And he's right, I think - following your GPS into the woods isn't exactly like plotting uncharted territory, but somehow it takes you to that same place in your mind, the place where you are hunting, where you are on a quest for discovery. In creating a radio documentary, there's the idea and then there's the story. I didn't really think about how different they were before I came here. A story encompasses an idea, but it has so much more - it has characters, conflict, a movement from here to there. In class, we talked about fitting our story ideas into the following sentence: "someone does something because, but..." So. Mainers go off on the weekends and hunt for treasure because...a) they have an innate desire to hunt b) they have developed friendships and communities around the sport c)? d)? ?, but...but what? How does one find a "but"? But TBA. So, story lock-down. It sounds so harsh, like a prison sentence. While I've made some contacts, and made some plans (on Saturday I'm hitching a ride with a cacher up to a group caching event in the North Woods of Maine), I still feel lost, like I don't quite have the coordinates for my destination. I imagine myself as one of those old time explorers - holding a treasure map with burned edges, clad in pantaloons - hunting and digging, hunting and digging, hoping to find somewhere to mark my "X". So I guess I'll keep doing that. And I'll dream, I'll grind my teeth, and I'll wake again. The first two weeks at Salt have been disorienting. We are a group of students gravitated from all corners of the States, transferred to Maine to tell the stories of its people and therefore the essence of the place. I’m from Georgia. I know I have a lot to learn. We’ve spent a lot of time in classes, going over the mechanics of what is to come, but I’ve felt distant from the task. And although the walls of Salt and the people that fill them are always encouraging, I have felt the need to get out—to see the land and people of Maine. This is why the Saturdays spent in Old Orchard Beach have felt so invigorating. To visit a place is to feel the movements of its people, to see their constructs and their caverns, to gain access to their transformation over time. On our first day in Old Orchard, the center point of downtown and all that spanned from it seemed weighed down by the overhead grey. Great shapes of steel—the ferris wheel, carts, and arcades, all appeared locked into the land. Maine’s one sandy beach was as idle as rock. The morning was shaken only by the excited drawl of two men eager for the outlet of a camera and microphone, whose faces were leathered and carved with age, and breath was already darkened with whiskey. The place was fragile and I wondered if our notepads, cameras and headphones were stirring its rest. With the passing of the day the streets were quickened, but it felt almost forced by the abrupt arrival and departure of the motorcycle parade. They were just as slow and bumbling as the rest of the tired town. On the other hand, our second trip to Old Orchard was met with sun and blue sky. Bodies curled over motel balconies and riddled the air with the wide-mouth French of the Quebecois. Little feet clapped the grown and children rang out in laughter. The air was thickened with the smell of fried dough. Our skin was warmed and so was our liking to Old Orchard Beach. The town was breathing and pulsed and weaving with bodies and intersecting streets. Old Orchard was lit. It is this contrast that only demonstrates the vulnerability of this place to the seasons. With the seasons change the people, and through the people a town can transform. The shopkeepers and their beloved tourists will flee for the south or the north, for warmer or colder homes, and will leave behind snow buried streets and steel sculptures of what was, leaving Old Orchard calmed and quiet through winter. In addition to this the transformation that the town has experienced over the seasons, people’s stories can construct a place that’s been lost over time. A coffee shop waitress with tattoos and blue eyes told us of the Old Orchard Ballroom that, after one too many storms, fell into the sea, taking with it the wood paneled floors, the curtains, and the era. I guess what I’ve gathered from this is that places are amorphous, constantly mutating to the people that live within it. Salt loves trial by fire! 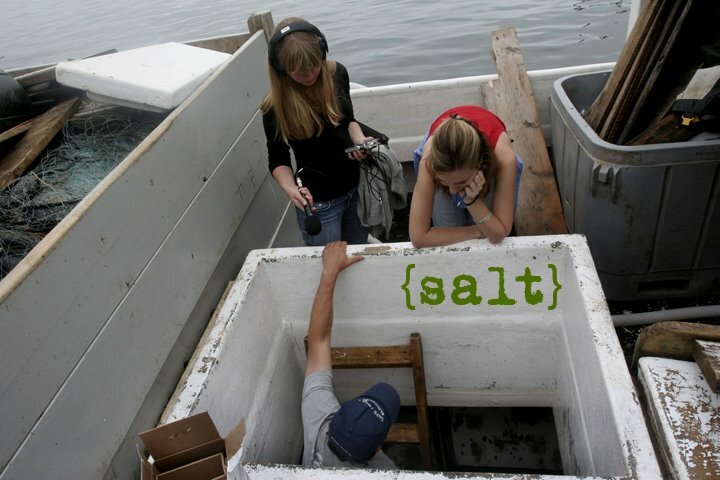 In our first week at Salt we dove into a mini-ethnography project for the Approaches and Fieldwork course. The purpose of the mini-ethno is to go out and immerse ourselves in a community, find an interesting story to tell, and learn how to work as a team of photographers, writers, and radio producers. By the first weekend, we were out in the field looking for a story. My group ended up in Funtown, a family-run amusement park outside the town of Saco. What am amazing experience! 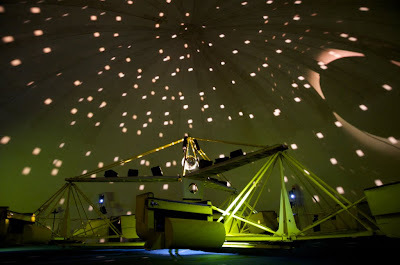 We focused on a particular ride called the Astrosphere, a fast and furious ride and visual light show of black lights, strobe lights, spot lights, and projections onto an pressurized dome. The same song, Fire on High by Electric Light Orchestra, has been played for every show since the 70s. The family let us spend two full days that first weekend at the park interviewing and photographing people about Astrosphere. I was amazed at how open and approachable people can be when you overcome your initial fears of invading other people's space. One question I did have was the issue of finding conflict and tension in telling a compelling story. I didn't quite understand what our professors wanted, especially since our story was about an inanimate object. I began questioning myself: What is conflict? What does it mean to look for conflict in a story? Is it right or ethical to prod or seek conflict when a subject is opening up to you? I don't believe we should direct the conversation so a subject reveals conflict in his/her life. With our mini-ethno, the subject of our story is an amusement park ride. How do we find conflict there? Due to this mini-ethno, I've had to deconstruct my idea of conflict. It doesn't necessarily have to come in the form of conflict between people. Conflict could come from dealing with the weather, economic hardship, competing against other corporate amusement parks, etc. The Astrosphere as an object does not engage in conflict itself, but it is subject to the trends of culture and weather. But I still question why compelling stories can't just be positive without seeming like fluff pieces? Can't a profile be an engaging story? Don't we need more essentially positive things in life? I am sure these feelings will evolve throughout my time here at Salt!